Here you will find a complete list of all the payment methods, you can easily verify the list of payment methods assigned to your merchant account or to request and activate new payment methods of your choice. When you access the Payment Methods tab you will see a complete list of all the payment methods available for your merchant account. You have the possibility to search for specific payment methods using different search filters and to see the description for each payment method. You can search for a specific payment method using the search filters available: payment method’s status, name, description, guaranteed status and countries available. A very important step during the configuration process is setting up your payment methods. In this section you will be able to configure the preferred way to receive your payments and setup your desired payment methods. The payment methods are selected for an account when the account is created, but they can also be changed at any time needed. Using the first search filter from the top of the page, choose Can Request option from the dropdown list. 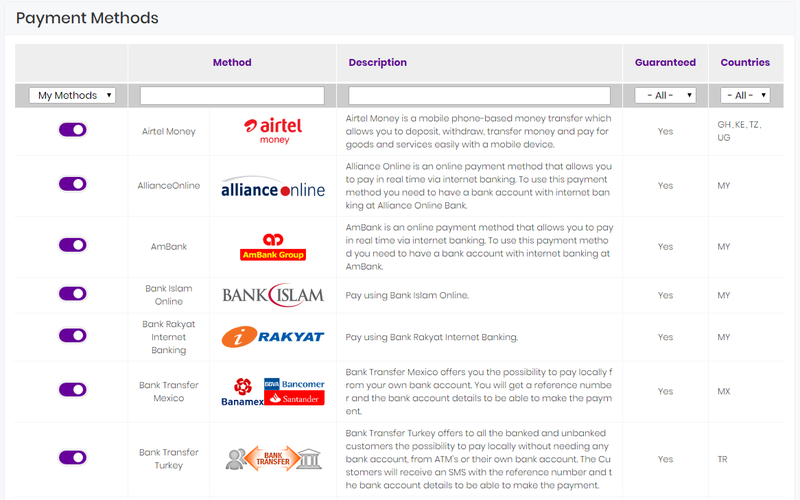 A list of all the available payment methods that you can request for your account will appear. A confirmation message will be displayed. After you have requested the payment method, you need to wait for Smart2pay approval of the payment method. Also, you can check the list of all your requested payment methods by using the first search filter from the top of the page. Choose Approval in Progress option from the dropdown list and a list of all your requested payment methods for your account will appear. Using the first search filter from the top of the page, choose Can Activate option from the dropdown list. 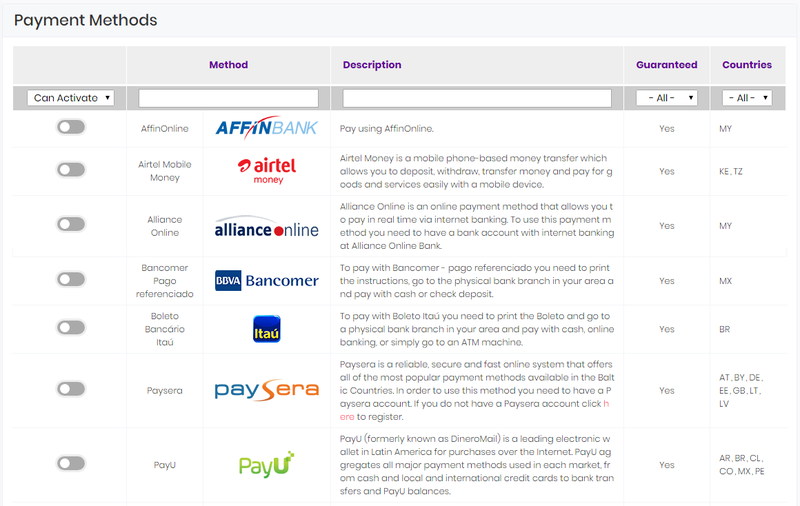 A list of all the payment methods assigned to your account that you can activate will appear. Once you find the desired payment method, click the Activate option in front of it to activate it. You need to wait for Smart2pay approval for the activation of the payment method. Also, you can check the list of all your payment methods that are waiting activation by using the first search filter from the top of the page. Choose Activation in Progress option from the dropdown list and a list of all your payment methods waiting activation will appear. Using the first search filter from the top of the page, choose My Methods option from the dropdown list. 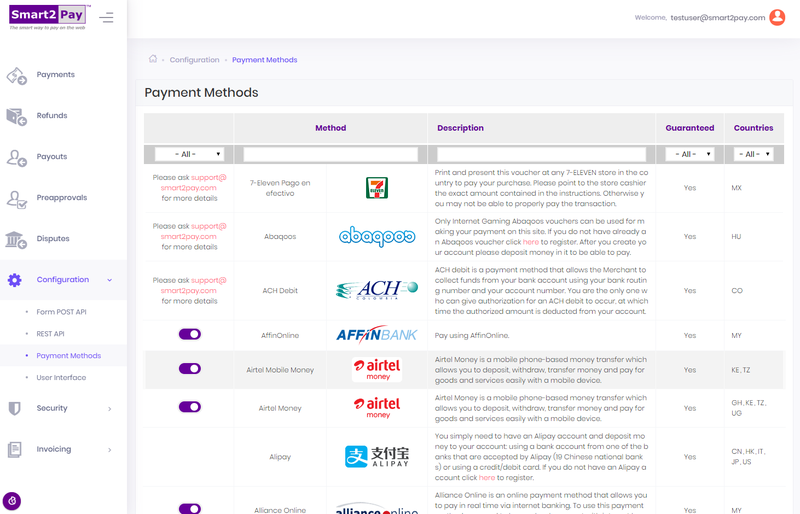 A list of all the payment methods activated for your account will appear. If you want to deactivate a specific payment method, click the Deactivate option in front of it. For some payment methods you need to ask our support team for more details regarding its availability. You can check the list of all the payment methods that need further guidance from our support team by using the first search filter from the top of the page. Choose Ask Availability option from the dropdown list and a list of all the payment methods that need further guidance from our support team will appear. Some payment methods may be currently unavailable due to different external factors. You can check the list of all the unavailable payment methods by using the first search filter from the top of the page. Choose Unavailable option from the dropdown list and a list of all the unavailable payment methods will appear. If the request of a payment method will have a negative outcome we will let you know. You can check the list of all the rejected payment methods by using the first search filter from the top of the page. Choose Rejected option from the dropdown list and a list of all the rejected payment methods will appear.